This post was sponsored by Nasoya. All opinions are my own. These Coconut Cream Pie Cups are absolutely ridiculous. Ridiculously good, that is. They’re the best dessert I’ve made all year. Wait…I know that doesn’t sound impressive, since it’s still January. But I’m willing to bet that come December, these babies will still be up there. To die for. So what possessed me to put dreamy, custard-like coconut cream pie filling in a baked wonton, then top it with fresh coconut whipped cream and toasted coconut? I’m so glad you asked. After I posted these Crispy Mushroom, Onion and Feta Rolls, made with egg roll wrappers, Nasoya contacted me to ask if I’d be interested in using one of its products to make an appetizer or dessert that could be served on Super Bowl Sunday. And, since Nasoya is the brand of wrappers I use and feel good about bringing into my home (no weird ingredients) it was a no-brainer for me to say yes. And, since coconut cream pie is my husband’s favorite — it was his birthday “cake” last year — I had to see if I could turn it into cups using the wonton wrappers. Oh my, we’re so glad I did. 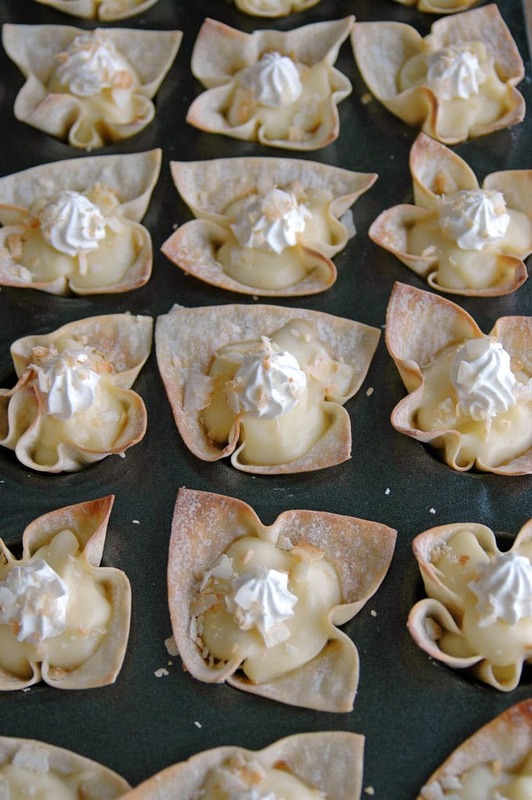 With each bite, you get this crunch from the crispy wonton, plus you sink your teeth into this creamy, smooth, luscious filling (made with equal parts coconut milk and half and half), topped with toasty coconut and the coconut-accented whipped cream. Yum! I’m going on the record to say I prefer these Coconut Cream Pie Cups to the traditional pie version. If you love coconut, you’ve got to try these! 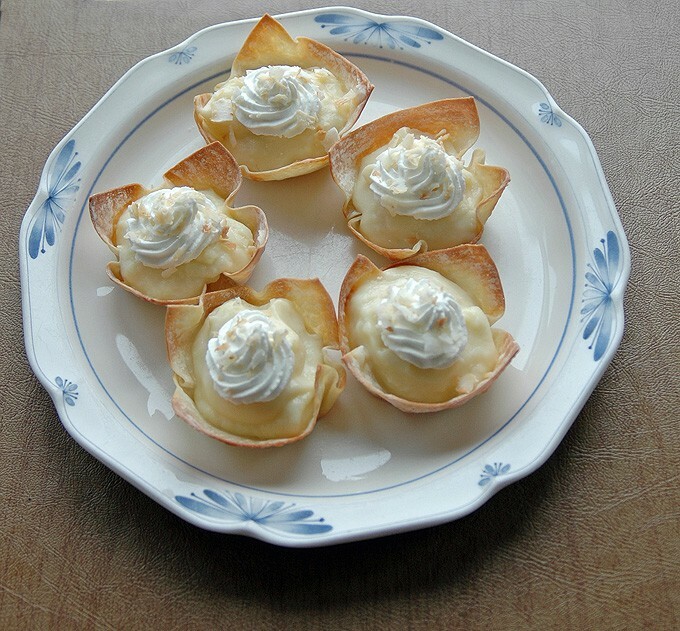 And if not, you could fill the baked Nasoya wonton cups with the pudding of your choice and top them with whipped cream, nuts, chocolate chips, whatever suits you. Just press a wonton into each well of either a cupcake pan or a mini-muffin pan (I did some of each for the photos) and bake for about nine minutes, or until golden brown. Then you cool the cups and fill them. 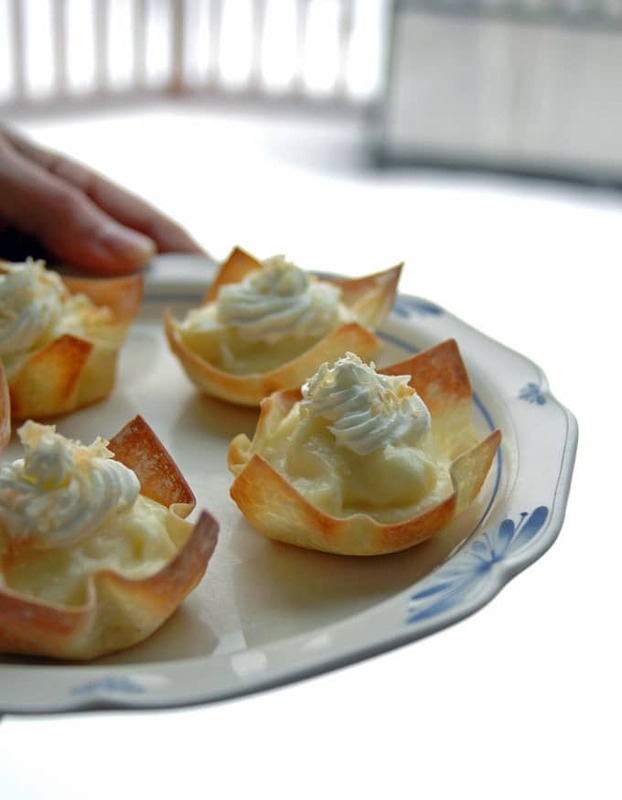 Baked wontons are used as the base for these fabulous Coconut Cream Pie Cups, topped with fresh coconut whipped cream and toasted coconut. To die for! Preheat your oven to 350 degrees F. Press one wonton into each well of a cupcake pan (or use a mini-muffin pan), forming a cup. If you have a wooden dowel, use it to help shape the mini ones. Bake the cups for about 9 minutes, or until golden brown. Let the cups cool in the pan on a wire rack. While the cups are baking, you can toast your coconut in a 12-inch skillet on the stove. Pour the coconut flakes into the skillet and stir them over medium-high heat until they are just getting golden. It should take five minutes for unsweetened, and less for sweetened coconut. Transfer the coconut to a bowl to cool. For the filling, place your coconut milk in a medium sauce pan. Fill the empty coconut milk can with half and half and pour that into the pan as well. Add the eggs, sugar, corn starch and salt. Over medium-low heat, whisk the ingredients and stir constantly until the mixture thickens and bubbles. It will take around 16 minutes, depending on your pan. Turn off the heat and stir in the vanilla and coconut extracts. Using a scoop if you have one, place 1 1/2 tablespoons of filling into each cooled cup (regardless of whether you used the mini-muffin pan or the cupcake pan). Chill the filled cups in the refrigerator while you make your whipped cream. For the whipped cream, beat the whipping cream and confectioners sugar in a clean, medium stainless steel bowl with a mixer until the cream is about half way to being stiff. Add in the coconut extract and continue beating until stiff peaks form. When the coconut filling is chilled and set in the cups (mine took maybe 15 minutes), top each pie cup with some whipped cream, using a pastry bag to pipe it on if you wish. Then, sprinkle some toasted coconut onto each pie cup. Keep the filled cups refrigerated until you're ready to serve them. Refrigerate leftovers. The pie cups are best served within the first couple of hours of being made, for maximum crispiness. You can make the filling and toast your coconut the day before, but bake the wontons and make your whipped cream the day of serving. There are 48 wonton wrappers in a package. You can bake the extras and fill them with leftover whipped cream, or freeze them for up to two months. If you wish to make a traditional coconut cream pie, double the filling. 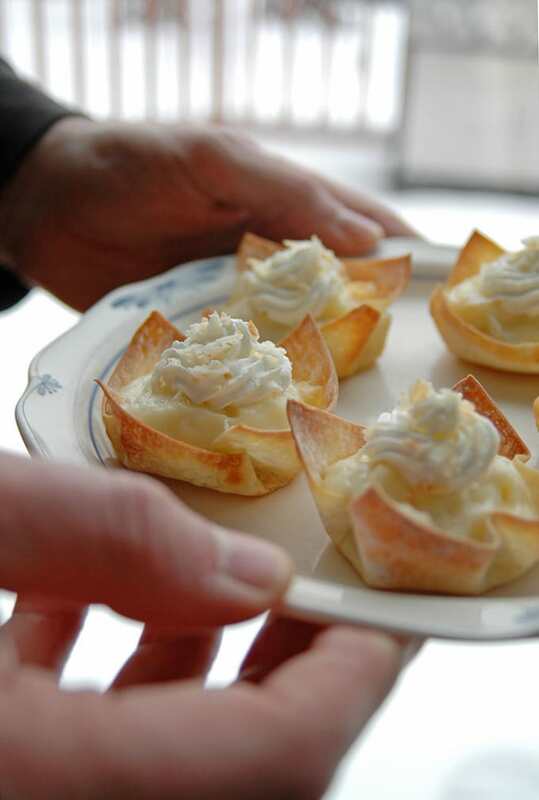 These coconut cream pie cups look delicious, Andrea! Love baking with filo pastry – so flaky, buttery and tasty. I did read your post about the coconut falling off the tree. Too funny! I can only imagine how delicious the fresh coconut would be in this dessert. Thanks, Cheryl! Gorgeous looking pie cups, Andrea! Specially when I’m not in mood to make a whole pie, these can be soo perfect for little indulgence! I also love the idea of coconut cream filling! Thanks, Savita. These are so addictive! I’ve never used wonton wrappers for dessert and now I realize how much fun and flavor I’ve been missing. These look delicious, Andrea!! I feel the same way, Annie. 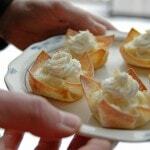 Once I heard that people have used the wontons to make cannoli cups, it was easy to start imagining what other desserts I could make with them. So fun. Thanks, Annie!